Following our tradition of reporting statistics in interesting numbers, we're happy to announce there are now 22,222 collectors connecting on Colnect. During the last month, Colnect has been visited by more than 150,000 people. If you're one of those collectors visiting Colnect but have not yet chosen to become a member, you're welcome to join us. 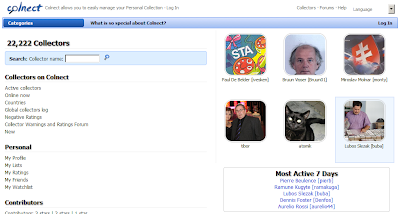 Colnect is really special in the services it offers collectors. Right now, Colnect offers public catalogs of stamps, phonecards, coins, banknotes, bottle caps, tea bags, post cards, bank cards, travel tickets, Casino cards, hotel key cards and beer coasters. Now a days Colnect’s phonecards catalog is the largest one in the world. If you collect and want to connect with other collectors, Colnect is the best place for you.